How do I consolidate all subscriptions into one account? (Note: if you are a large practice with more than 10 practitioners, please contact us for a specialised solution). If you are a clinic with 1-10 practitioners, Physitrack lets you conveniently manage subscriptions for all staff from one account. Benefits are that you have one monthly invoice charged to one single credit card. 1. Login to the account that already has a valid, paid-for Physitrack subscription. 2. Go to My account > Subscription and click the "0 colleagues on subscription" button. 3. Enter the email address of the colleague that you want to add to the subscription. 4. You can add several colleagues at once. When you are done, click the "Add to subscription" button. The subscription period to which all colleagues are anchored, is the subscription period of the parent account. For the first month, you will only pay the pro-rated amount for each subscription. 5. Once you have added your colleagues to your account they will receive an email to complete their registration. 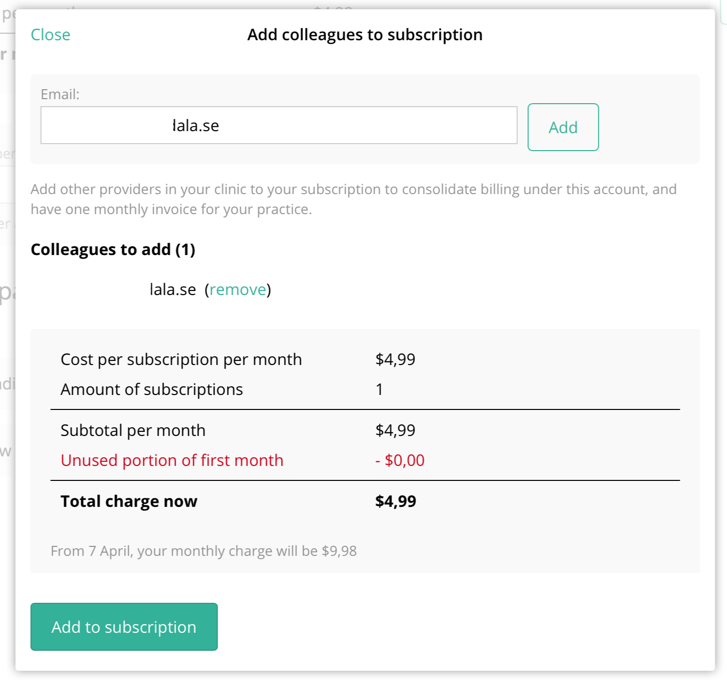 You can add and remove colleagues from your subscription at any time. After a colleague has been removed, he/she will need to buy his/her own subscription. If you cancel your subscription, this will also end the subscription for any added colleagues. What is the best way to use Physitrack with multiple practitioners?